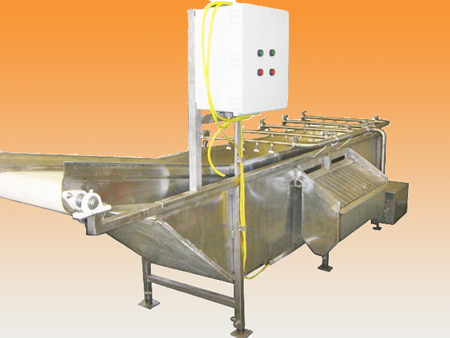 Wash System, Single Tank (tank width is 24”) with 18" wide KVP 38% Open Mesh Conveyor Belt, Hydrosive Filtering System, Stainless Steel Sanitary Spray Bar Tubing and Stainless Steel Pipe Fittings with Removable Nozzles for Cleaning, 1 Hp Stainless Steel Sanitary Pump. 1/2 Hp Conveyor Motor and Gearbox housed in Stainless Steel Box, Lift-Out Conveyor for Washing, Hookup Inlet for Cold Water Source. Sanitation in-line dispenser is optional using Klorman Calcium Hypochlorite dispenser built-within the Spray Bar System or using Pulse System 3 (ORP & pH) Automated Sanitation System. Dimensions: 120" x 24" x 30"
(overall width 32" with motors) Electrical 230V - 3 phase or 460V - 3 phase. G-SWASH 230v - 3Ph 1hp 120" x 24" x 30"